Euclid’s “proof” that there are exactly five regular (convex) polyhedra is well known and pretty simple. Observe that there have to be at least three faces meeting at each vertex, and the angles of those faces have to add up to less than 360°. 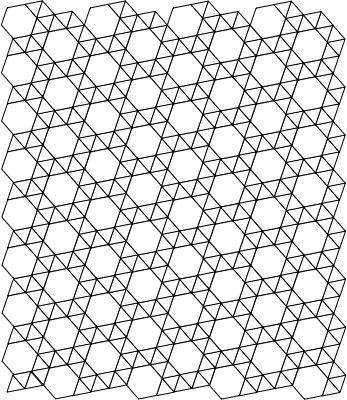 For instance, three hexagons surrounding a vertex add to 360° and they lie flat; they don’t make a corner. Three heptagons don’t even fit in 360°. So a vertex of a regular polyhedron can be three, four, or five triangles, three squares, or three pentagons — that’s all. And there are indeed regular polyhedrons of each of those five types: tetrahedron, octahedron, icosahedron, cube, dodecahedron. And there are no others. “Proof” is in quotes, because Euclid omitted one thing: He didn’t prove there can’t be more than one polyhedron for any vertex type. There can’t be, and that’s pretty clear to anyone who’s ever cut out triangles and squares and pentagons and tried putting them together, but the rigorous proof of it didn’t come until, I think, around the 17th century. 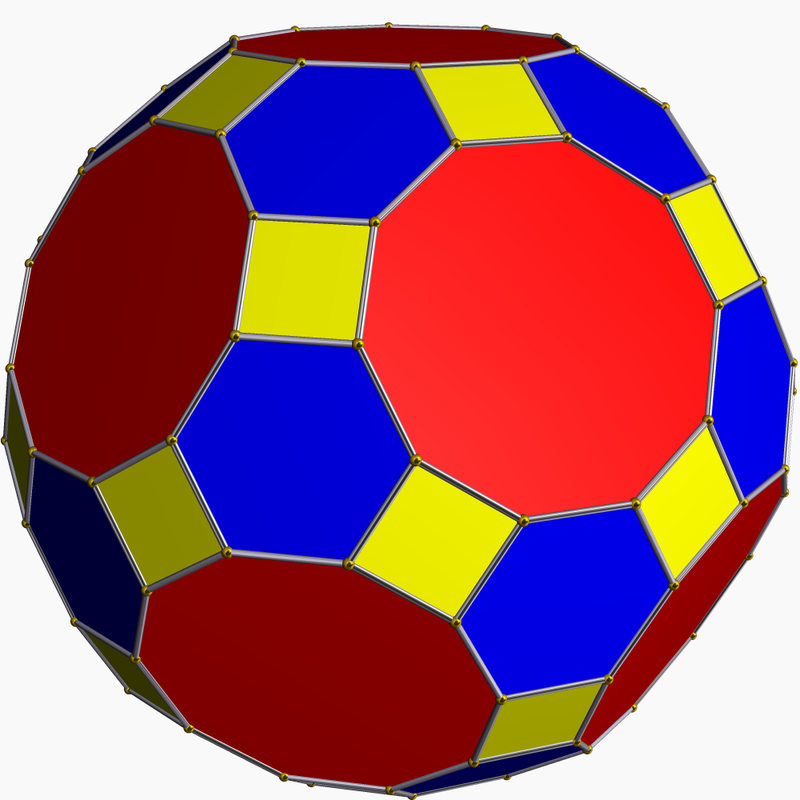 What about the uniform (convex) polyhedra, though? Recall these are polyhedra with regular but not congruent (convex) polygons as faces, and congruent vertices. Actually the vertices have to be transitive, which is a stronger requirement, but for now we’ll just talk about congruence. I wrote before about how you can derive the Archimedean solids — the uniform polyhedra other than the prisms and antiprisms — from the regular polyhedra by truncation, rectification, and alternation, but how do we know we got them all? Let’s try counting them similarly to the regular polyhedra by looking for valid vertex types. Can we limit which kinds of polygons are used in a uniform polyhedron? No. Because now instead of requiring at least three of them to fit around a vertex, all we have to require is that one of them plus at least two other polygons fit around a vertex. And since the interior angle of any (convex) polygon is less than 180°, you can always use one with three triangles or two squares. Let’s think about the 3-vertices. If all three faces are the same then it’s a regular vertex, not uniform, so either two are the same and one is different or all three are different. 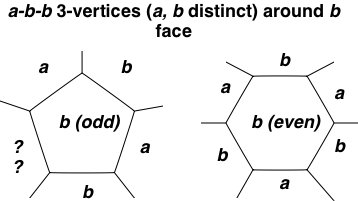 The vertex is either a-b-b (or the equivalent b-b-a or b-a-b) or a-b-c where different letters correspond to different values. Suppose it’s a-b-c. Consider an a face: at each vertex around the face, the adjacent face to the left must be b and the adjacent face to the right must be c, or vice versa. So if one adjacent face is b the next is c, then the next is b, and so on: they alternate all the way around between b and c. But if a is odd then this doesn’t work: the last adjacent face will be b and you’ll have an a-b-b vertex instead of a-b-c. So if a, b, and c are all different, then a must be even. But by the same reasoning, b and c must be even too. If we have a-b-b then all the faces surrounding a are b: there’s no alternation, so a can be odd or even. But in that case consider a b face. An adjacent a face must be followed by a b, which must be followed by an a, and so on: again there’s an alternation around the b face, which doesn’t work if b is odd. Therefore b must be even. All right. So we can only have a-b-b where b is even, or a-b-c where a, b, and c are all even. In other words, we have to have either two equal even faces, or three unequal even faces. Now the 4-vertices. Here either at least one face is unique or there are two of one kind and two of another. Also at least one face must be a triangle to fit in 360⁰. Otherwise we can have: a-b-c-d, a-b-c-c, a-b-b-c, a-b-c-b, or a-b-b-b, where different letters are unequal. In the first case, an a face must have b and d faces alternating around it, so a must be even. So must b, c, and d by the same logic. But we know one face must be a triangle, so that’s ruled out. Similarly, in a-b-c-c, a and b must be even. So must c, because if you think about it, adjacent faces around a c face must alternate between c and either a or b. Again, though, we know there’s a triangle, so this is ruled out. So is the equivalent a-b-b-c.
Now, as with the regular polyhedra, we’ve only shown how many valid uniform vertices there are; we haven’t proved there’s only one polyhedron for each vertex. In fact we can’t prove it, because it’s not true. 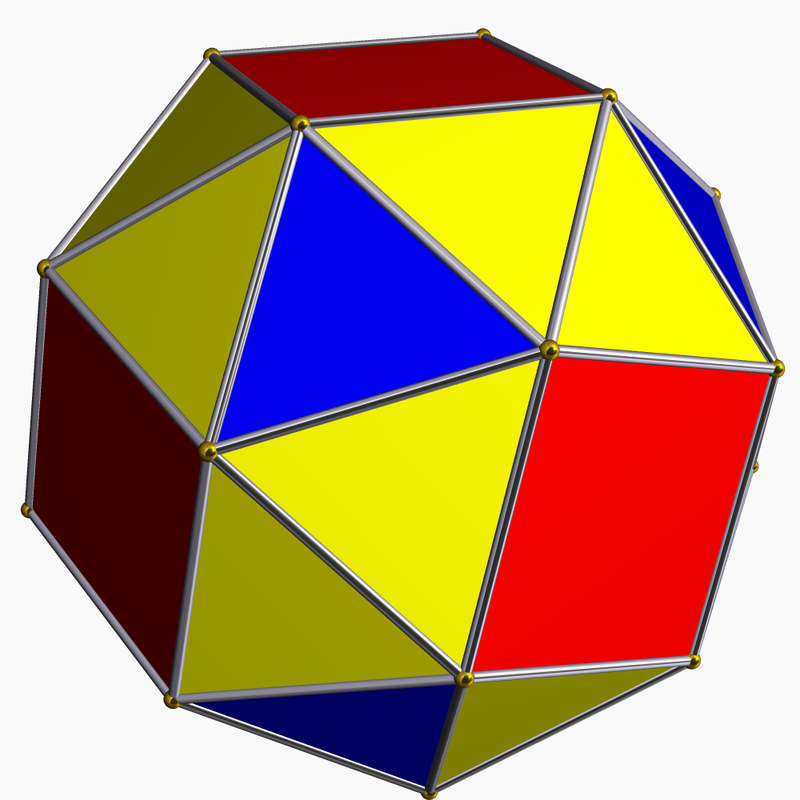 There are two polyhedra with 3-4-4-4 vertices: the rhombicuboctahedron and the pseudorhombicuboctahedron. 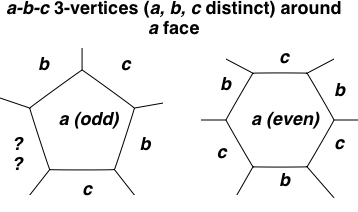 The latter’s not counted as a uniform polyhedron because while its vertices are congruent, they aren’t transitive. So the proof runs a little short: you need to show that, aside from the pseudorhombicuboctahedron, there are no other polyhedra, or at least no vertex transitive ones, with any of these vertices. (There are no others.) But at least we know what vertices are allowed. I was thinking about the Archimedean solids, and pondering how the heck did Archimedes come up with, say, the snub cube or the truncated icosidodecahedron? (Images from Wikimedia Commons, created using Robert Webb’s Stella software. <– Mandatory fine print) Or more generally, how did he come up with all thirteen of the Archimedean solids? And what are the Archimedean solids? They’re polyhedra, as you can presumably figure out from the pictures; like the Platonic solids (or regular polyhedra), they are convex polyhedra, their faces are regular polygons, and all the vertices are congruent. Unlike the Platonic solids, their faces are not congruent. The prisms and antiprisms (take two congruent polygons with unit length sides, place them in parallel planes a unit apart, and connect each vertex of one to the corresponding vertex of the other, making squares all around; that’s a prism. Do the same but rotate one of the polygons and put it a little closer, so you can connect each vertex of one polygon to two vertices of the other with unit length lines, making equilateral triangles all around; that’s an antiprism. 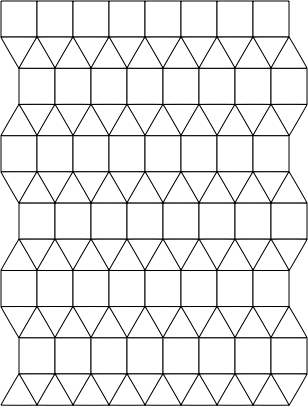 There’s an infinite number of each, corresponding to all possible polygons — though a square prism is just a cube, and a triangular antiprism is an octahedron.) satisfy these requirements but are regarded separately. And the (deep breath) elongated square gyrobicupola or pseudorhombicuboctahedron satisfies them too, but isn’t usually counted: Archimedes didn’t (he may not have known about it), and its vertices are congruent but not transitive — which means it lacks the kind of rotational symmetry the other Archimedean solids (and the prisms and antiprisms) have. There turn out to be thirteen Archimedean solids, and Archimedes enumerated them all. How? Well, he was a friggin genius, wasn’t he? But also, you don’t have to pull them out of thin air. You can construct them all using the regular polyhedra as a starting point. I’m not saying it’s easy, but you can. 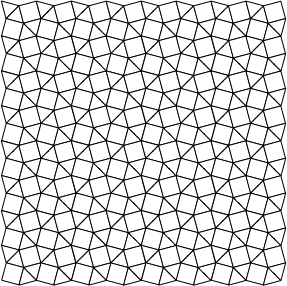 What’s easier, and gives you the general idea of how it would work for polyhedra, is to do the analogous thing with tilings of the plane — which, in a way, are like degenerate polyhedra. 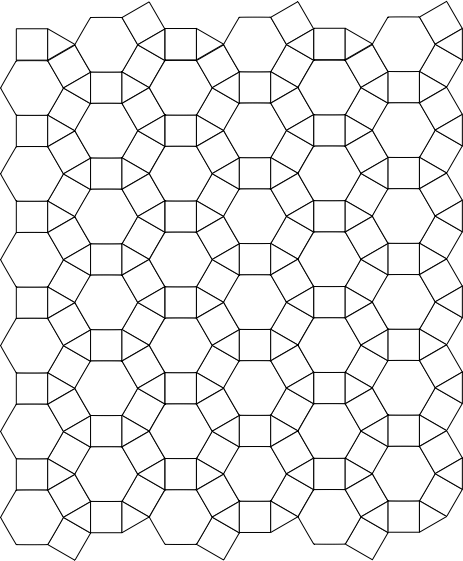 A uniform, but not regular, tiling using octagons and squares — all convex regular polygons, and all the vertices are congruent, but the polygons aren’t. There are 2 octagons and a square at each vertex, so we call this 884. Which is just the 4444 tiling we started out with, rescaled and reoriented. This operation is known as rectification. 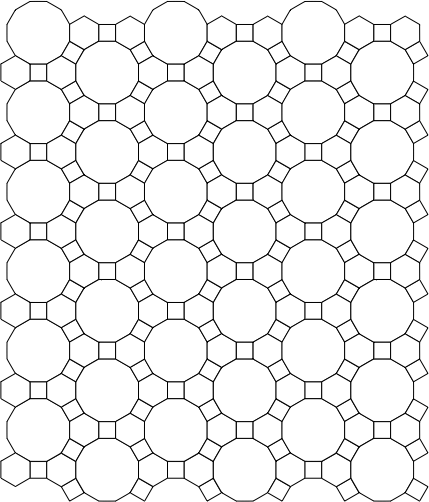 This is a tiling, but not a uniform one. For one thing the triangles are not regular — they aren’t equilateral. For another thing the vertices aren’t all congruent. Truncation similarly doesn’t work out. but that’s dual to 666 and it turns out we can’t get anything from 333333 we can’t get from 666. Two dodecagons and a triangle at each vertex, so it’s 12-12-3. 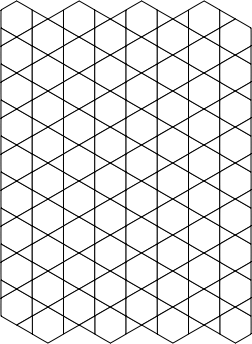 You create lozenge-shaped gaps between the squares. They could be divided on a diagonal to make two very non equilateral triangles. 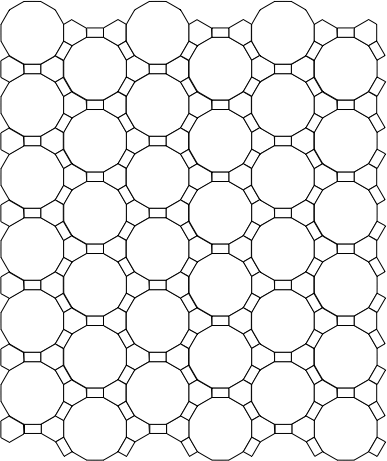 That would be a tiling but not a uniform one. This is 63333. 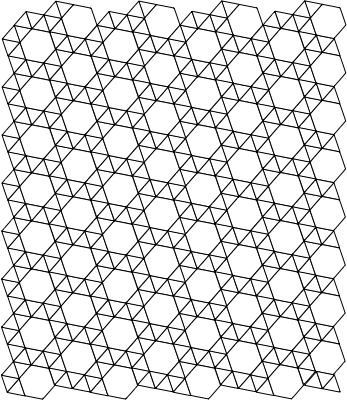 Alone of the uniform tilings, it is not mirror symmetric. 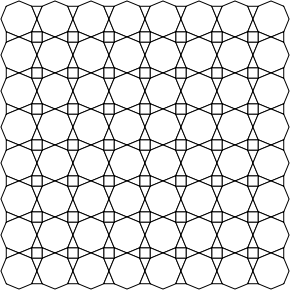 That is, there’s another form of it which can’t be obtained from the first by translation or rotation: 43433 and 63333 are called snub tilings. 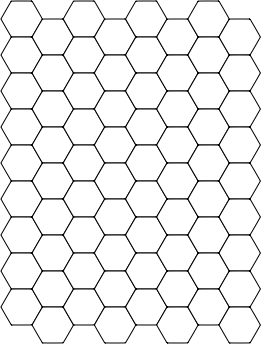 Another way to think of them is you start with the regular tilings 4444 or 666 and pull them apart in all directions, creating gaps between the squares or hexagons, which you then fill with triangles, twisting the squares or hexagons as needed to make them fit. It’s 44333. 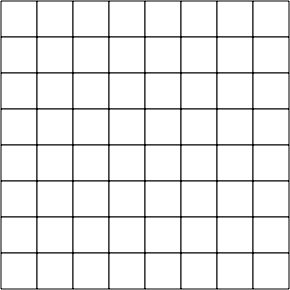 You can also think of this as 333333 pulled apart in the vertical direction with the gaps filled in with squares. It’s a planar analog of antiprisms and prisms, kind of. That’s the lot. 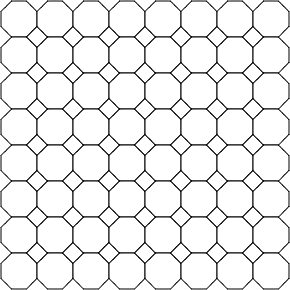 There are other transformations you can apply to create a new tiling from an existing one, and we haven’t tried applying all the transformations discussed here to all the tilings, but if you do you get either non uniform tilings or uniform tilings we’ve already found. Left to the reader as an exercise: Do the same thing starting with regular polyhedra. Construct all the Archimedean solids. 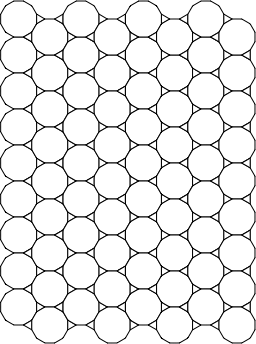 Extra credit: Uniform honeycombs of 3-space and uniform 4-polytopes.